Proving for the nth time that what happens in China is a pivotal impact factor to the commodities’ space, the most recent developments in that country sent base and precious metals prices, along with most global equity markets, lower overnight. The first forecast for lower economic growth in eight years for that country derailed many an asset as the new trading week commenced. Gold and silver were clearly not immune to the negative news. Gold prices dipped well under the key $1,700 level in the process once again this morning, while silver fell one dime under $34 per ounce following a feeble attempt to stage a recovery after the opening bell in New York. Despite the wedding season’s unfolding in India, locals opted to remain sidelined when it came to buying into rising prices in gold on the back of a weakening rupee. Speaking of weakening, the loonie took one on the beak this morning and sank to $0.9928 against the greenback as so-called ‘commodity currencies’ followed the Chinese news with dismay. The BoC is widely expected to keep interest rates at 1% when it makes an announcement on Thursday. 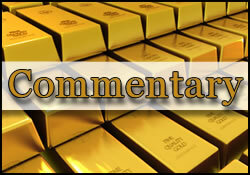 Opening bids for New York spot gold prices came in at $1,703.70 per ounce and at $34.44 in silver. Platinum dropped $27 to $1,668.00 while palladium declined $4 to the 706.00 per ounce mark. On the supply side for gold, it was reported this morning that Australian output for the yellow metal remained relatively flat in 2011, but still resulted in that country’s second-place ranking on a global basis (just behind China). More than 264 tonnes of gold (only 2 tonnes less than in 201) were dug up Down Under. In the background, crude oil managed to hang on to very slim gains (up $0.40 per barrel to $106.96) as US-Israeli talks on the sticky subject of Iran’s nuclear ambitions were slated to get underway today. The US dollar was trading at 79.33 on the trade weighted index and the euro drifted towards $1.32 against it. The common currency hit a two-week low as concerns about Greece’s ability to pull off a debt restructuring deal remained manifest and as China’s expected lower growth turned off the appetite for risk. Gold-oriented ETFs added 8.5 tonnes to holding in the latest reporting period on market positioning by the CFTC. The "unremarkable" increase in tonnage, according to analysts at Standard Bank (SA) indicates some level of wariness on gold by the buyers of such vehicles. We must note that the report does not cover the meltdown in prices and related likely reshuffling of the speculative deck of cards that took place on the last day of February following Congressional testimony by Fed Chairman Bernanke. The same analysis by Standard Bank issued this morning opines that albeit there appears to be a higher degree of speculative confidence in silver than in gold, there "is a clear indication [as seen in the percentage net speculative length to total open interest] of a market that is becoming overstretched and consequently vulnerable to correction. Despite the apparent investor enthusiasm, we believe that silver’s downside remains exposed (mainly due to Chinese inventories), to below $33/oz. We don’t believe that rallies beyond $35/oz. are sustainable yet," concludes the report. The speculative positioning in platinum remains quite robust, and ETF buying continued to be manifest with the addition of 21,300 ounces to platinum holdings (it was second-largest gain in balances this year). Similar optimism and buying in palladium underscores the fact that the investment crowd remains convinced about palladium’s future price prospects. About 37,000 ounces were added to palladium ETF holdings. This rising level of confidence in performance comes at a time when Thomson Reuters GFMS anticipates that palladium is likely to outperform platinum over the next several years. Talk of $1K palladium (while platinum might stall out near $1,700) was on tap by GMFS analysts at the PDAC gathering in Toronto. It is however worth noting that there is one potential factor that might hamper very swift progress in these metals towards much higher price ground. We are speaking here of the worst start to Chinese automobile sales in seven years. The first two months of 2012 saw a 3% decline in vehicle deliveries in that country and when coupled with the expectations of lower economic growth we covered here today, the caution flags are worth raising at this juncture. One more ‘China syndrome’ to add to the growing list. Still, for the time being, the labor-based difficulties in South African platinum output are likely to be felt in the physical supply pipeline for that noble metal as we roll towards April. Chinese Premier Wen Jiabao cautioned his fellow citizens to be on the lookout for slower economic progress in the current year as he addressed the national legislature overnight. Mr. Wen dramatically cut the target for Chinese economic growth when he offered a figure of 7.5% as the target for 2012. That number, for China, is a far cry from the "miracle" double-digit level growth seen for nearly twenty years and is also lower than the 8% expansion that had been forecasted by the government earlier this year. The Chinese Premier also emphasized that it is imperative for his nation to concentrate on distancing itself from its overdependence on exports and to try to foster domestic consumer demand. How much of this new (and for some, worrisome) outlook promulgated by Mr. Wen is owed to the recent warnings on China by the World Bank and/or the IMF is as yet unclear. However, suffice it to say that there is a growing realization among Chinese officials that something is amiss in that country and that fixing the problem is not a matter of a few months’ worth of hard work. We alluded last week to the "new China syndrome." It is, apparently, still afoot. A devastating commentary by Caixin Online, written on Saturday, exposes just how much of a problem the country has at a time when "Stat-italism" appears to have run to the limits of what it can do about sustaining economic growth. You thought you had heard it all when you read about the Navy’s $435 hammer? Get ready to hear of something even sillier than that when it comes to the prices of toilet paper holders on China’s bullet trains. Echoing a recent line from the World Bank, the Caixin commentary concludes with the warning that "If our pace of reform continues to lag behind the expansion of state-owned capital, we will soon hear talk of not the rise, but a crisis, of state capitalism." Over in the USA, the ISM’s gauge of the service sector rose last month, reaching the 57.3% mark and it exceeded the level that had been expected by polled economists. The US services sector is the principal employer of America’s workforce. Add another reason for Warren Buffett to be more of the "Doom Slayer" that some have labeled him as already being. Mr. Buffett raised untold pairs of (somewhat baffled and/or angry) eyebrows when he recently dissed gold and showed a fondness for equities and real estate in its stead. It might however be reasonable to assume that if Mr. Buffett saw "value" in gold at a given level – not the current one- (as he certainly did with silver at under $5 when he bought 138 million ounces of it -more than a year’s worth of retail investment demand) he might well make a short-term "play" in the metal. He is just not enamored with it as a long-term store of value and is apparently more inclined to be seeking out "productive" assets. When speaking of the (non-imminent) death of "fiat" currencies, one might as well consider the ultimatesuch medium of value exchange. Before you jump to name the obvious "hard" and shiny best currency, consider… Marlboros and Camels. Yes, indeed, it turns out that cigarettes are the world’s most stable international currency. In my native country, back in the 1980s, it was de rigueur to bribe your doctor or butcher with a pack of Kents in order to get any service of good. The little white boxes were never opened; they were just traded for a higher ‘value’ the next week, to another provider. Not a case of "Smoke’em If Ya Got’em" by any stretch. QE3 is imminent, but everything! Vladimir Putin is not a threat to world peace. Well, that about cover it all. Or, almost.